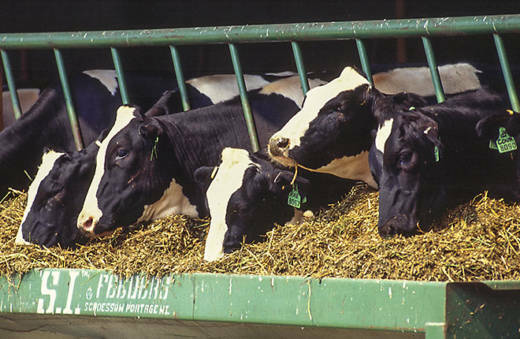 When cows belch, pass gas and make manure they release methane, a greenhouse gas. "If we can reduce emissions of methane, we can really help to slow global warming," said Ryan McCarthy, a science advisor for the California Air Resources Board, which is drawing up rules to implement the new law. In the nation's largest milk-producing state, the new law requires dairies and other livestock operations to reduce methane emissions 40 percent below 2013 levels by 2030. State officials are developing the regulations, which take effect in 2024. But dairy farmers say the new regulations will drive up costs when they're already struggling with five years of drought, low milk prices and rising labor costs. They're also concerned about a newly signed law that will boost overtime pay for farmworkers. Regulators are looking for ways to reduce so-called enteric emissions — methane from the bodily functions of cows. That could eventually require changes to what cattle eat. New Hope Dairy, which has 1,500 cows in Sacramento County, installed a $4 million methane digester in 2013, thanks to state grants and a partnership with the local utility, which operates the system to generate renewable power for the grid. But co-owner Arlin Van Groningen, a third-generation farmer, says he couldn't afford one if he had to buy and run it himself.